Courtship Display: Male raises crest, waves head and struts towards female. She will utter soft, chattering noises as he approaches. Sexing: Iris dark brown in male, pink/red in female. Surgical or DNA sexing required as juveniles. The Galah Cockatoos (Eolophus roseicapillus) - also known as Rose-breasted Cockoatoos - are generally well-adapted birds that are found in abundance throughout central Australia. They are also becoming increasingly common towards the coastal regions. 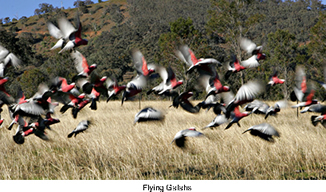 They are usually seen in large flocks, often feeding with Sulphur Crested Cockatoos. 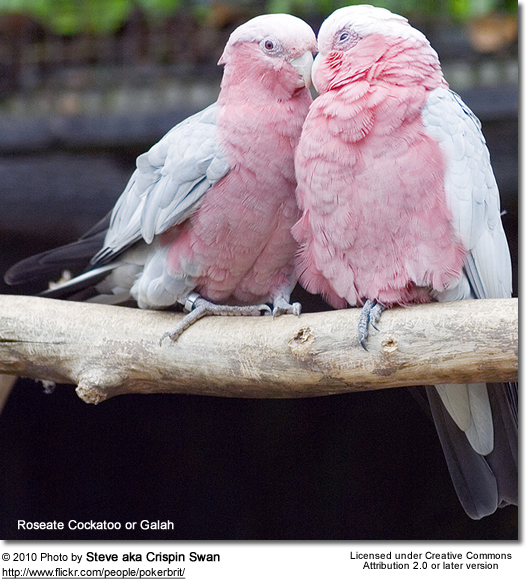 Galahs make wonderful, energetic pets and when trained with consistency have a good talking ability. These birds have an affectionate and bubbly personality and are extremely popular as pets. They are very smart and enjoy human company, loving to learn new tricks and impress their owner. Being well adapted to the dry conditions of central Australia, the Galah is a hardy and robust bird that adjusts well to climatic changes. They are also keen chewers and require toys or other forms of boredom relief to keep them stimulated and out of trouble. 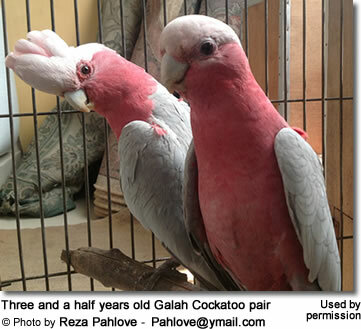 Pet galahs should always be obtained as hand reared birds from aviary-bred parents and once again, males generally make better pets than females. 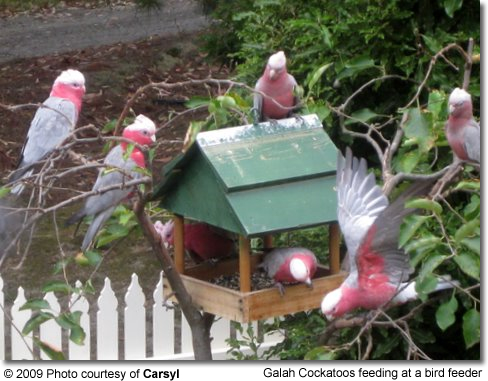 It is not advisable to obtain a pet Galah from the wild as these birds quickly revert to their wild behaviours and become difficult birds to keep. Galahs are especially prone to fat tumours and require a balanced, low fat diet and plenty of exercise as prevention. 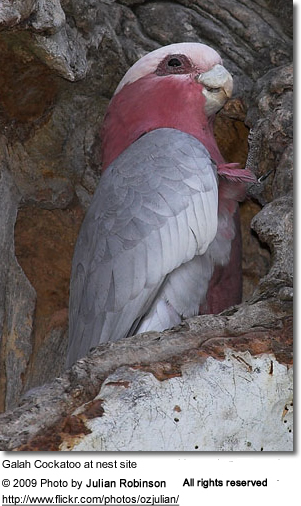 The Galah Cockatoo is one of the most common and widespread cockatoos. It occupies open country in almost all parts of mainland Australia. 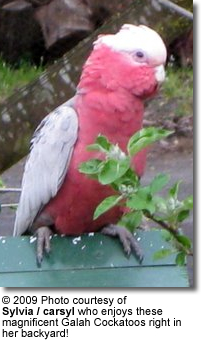 Galahs are found in all Australian states, and are absent only from the driest areas and the far north of Cape York Peninsula. They appear to have been self-introduced to Tasmania. They are common in some metropolitan areas, for example Perth and Melbourne, and common to abundant in open habitats which offer at least some scattered trees for shelter. 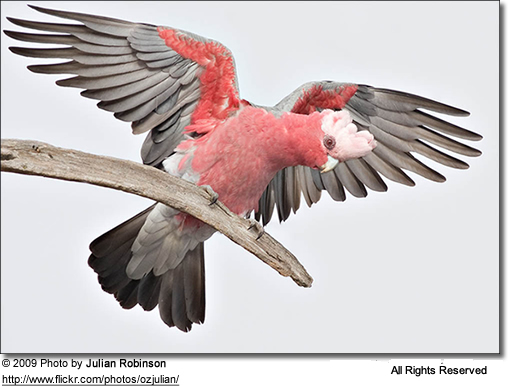 The changes wrought by European settlement, a disaster for many species, have been highly beneficial for the Galah because of the clearing of forests in fertile areas and the provision of stock watering points in arid zones. Galah Cockatoos typically measure around 14 inches or 350mm in length and weigh between 10 - 14 oz or 281 and 400 grams. 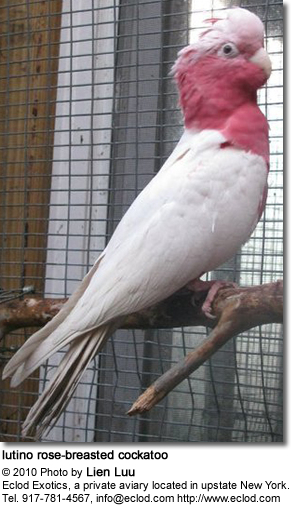 Galahs have a pale to mid grey back, a pink face and chest, and a lighter pink crest. Males and females look alike, differing only in eye color: the male has a brown iris, the female red. Owners have described the Galahs to be surprisingly "undusty" for lack of a better word. They are much less dusty than say african greys. Their pink and grey feathers feel soft to the touch. Below images courtesy of Eclod Exotics, a private aviary located in upstate New York. Cockatoos only breed once a year - usually between December and March, when vegetation growth is at its peak and food is readily available. Once a female has accepted a male, the pair will be spend a good part of the day preen each other's head and scratch each other around the tail. This serves to strengthen their pair bond. Before long, the male mounts the female to perform the actual act of mating by joining of the cloacae. This ritual is usually longer in new pairs and much shorter in bonded pairs. In some instances, the female may even approach the male to initiate the act. Pairs usually separate from their group to find a nesting spot in trees. The classification of the Galah is difficult. 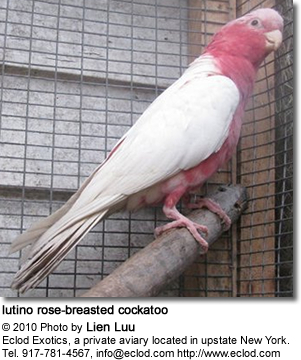 It was originally placed alone in the genus Eolophus, as there are clear morphological differences between the Galah and the white cockatoos that make up genus Cacatua (though older sources place the Galah in that genus). 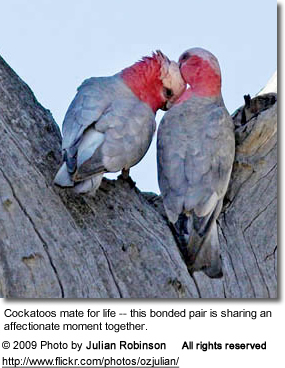 DNA evidence, however, conflicts with this, suggesting that the Galah is most closely related to the Cockatiel. It is thought that the ancestors of the Galah, the Cockatiel, and Major Mitchell's Cockatoo diverged from the main white cockatoo line at some stage prior to that group's main radiation. 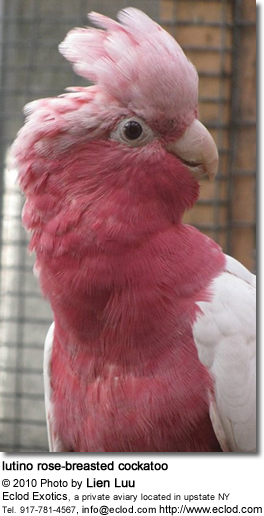 Aviary bred crosses of Galahs and Major Mitchells have been bred in Sydney, with the tapered wings of the Galah and the crest and colors of the Major Mitchell, as well as its plaintive cry. Three subspecies are usually recognised. The south-eastern form, E. r. roseicapillus is clearly distinct from the paler-bodied Western Australian form, E. r. assimilis, although the extent and nature of the central hybrid zone remains undefined. Most pet birds outside Australia are the south-eastern form. The third form, E. r. kuhli, is found right across the northern part of the continent, tends to be a little smaller and is distinguished by differences in the shape of the crest and eye-ring, although its status as a true subspecies is uncertain. 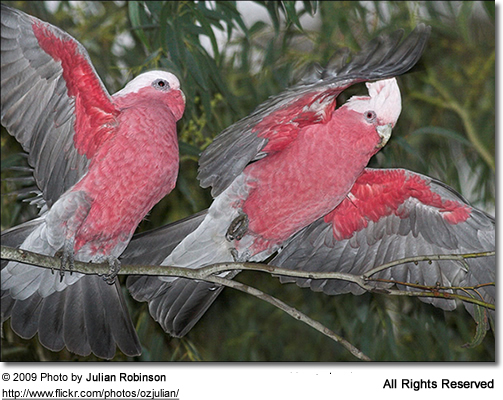 Galahs are highly social, affectionate and friendly - and very long lived. To take a Galah as a pet is not something that should be undertaken lightly as they bond socially with their owners and may very well outlive them. They will often become a little unpredictable as they mature and require training in order to integrate them into the family as a well-behaved "members of the flock." They are extremely playful and intelligent birds that need constant stimulation: interaction, toys, branches to chew on. They are not generally noisy, apart from early morning and evening. Both sexes can become good talkers; however, their talking ability is not usually on a par with either Sulphur-crested Cockatoos or the Corellas. 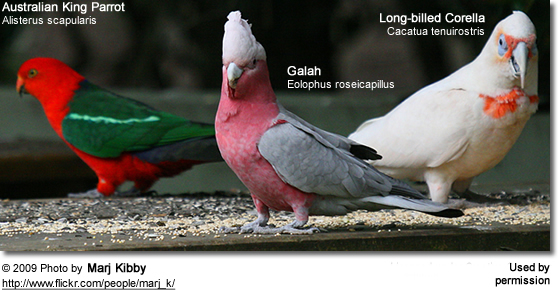 Galah is also derogatory Australian slang, synonymous with 'fool' or 'idiot'. Inquiries of Australian contrymen in the '70's suggest that this is a misunderstanding. Galahs are very self-confident and have a great zest for life, and are not embarrassed by anything they may care to do or be caught doing (unlike cats). It is very common to see them hanging by one leg from telephone or power lines in a rainstorm getting soaking wet and screeching with delight. There are many reports of them tobogganing down the corrugated roofs of outback buildings.